The Hendersonville/Station Camp/Beech hockey team seemingly scored at will against DCA/USN/MLK to the tune of a 10-0 shutout on Monday night at Centennial Sportsplex. The first period was a close one as HHS/SC/BHS held a 1-0 lead on a goal by Brodie Ruffing, assisted by Eric Hall. However, DCA/USN/MLK goaltender Carson Dorfman stood on his head and kept the game from getting out of hand, stopping 25 of the 26 shots he faced in the period. “Their goaltender played outstanding tonight, and I’m excited for their program,” Rathert said. “It’s their first year, they’re coming out and they’re learning and starting from the ground floor. Going back 20 years ago when we got started in Hendersonville, I know exactly how that feels. However, the Commandos offense proved to just have too much firepower, breaking loose in the second period with seven goals from six different players. Jaxon Rathert scored twice in the period, while Clayton Stickel, Shane Pearson, Alex Yarger, Blake Fuqua and Eric Hall all added goals in the period. “I think our kids played great tonight, they generated a lot of offense and we have a lot of skilled players,” Rathert added. “But my hats are off to DCA/USN/MLK, they played great. We’re fortunate, we have a few guys that are really experienced. Half of our defenseman are first-year or freshman. HHS/SC/BHS added two more goals in the third from Colson Leonard and Pearson to seal the 10-0 mercy-rule win. Ruffing, Hall, Leonard (3), Thomas Hasselblad (2), Alex Yarger, Slava Yarger, Emma Knoll (2) and Logan Haynie all added assists for the Commandos. Through two games this season, the Commandos lead the GNASH league in goals scored (16) and they are the only team to not allow a goal yet. Last year, they finished with the second-best record in the league (12-1-1) and scored the third-most goals (84). 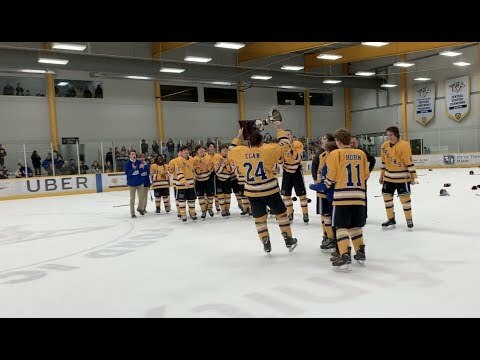 All of the recent success of the high school program speaks volumes for the growing support of bringing an ice hockey facility to the Hendersonville area. The idea has been tossed around for a while now, and pending legislation has proved to be the biggest road block in bringing the facility to fruition. According to Rathert, the Commandos’ on-ice success is point-proven why the facility should be built.